It was gratifying to see Janelle Mon´e on the same stage where I saw Funkadelic. Though her music comes to us through a time tunnel from an altogether different millennium, like George Clinton she frames physically persuasive, danceable music with complex, cerebral narrative. Monae was radiant. She had an electric, formal stage presence — post-Victorian Gibson girl meets Grace Jones — with a dignity and drama worthy of her muse Fritz Lang. 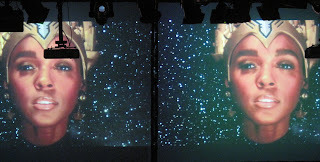 Above the stage, her image reproduced in black-and-white on two video screens had a grainy newsreel quality, as if we were in the future watching footage of the historic events of the present. The acoustic space was filled to bursting by a sharp trio playing guitar, drums, and keyboard. The stage was haunted by costumed extras: wraiths, birds, buccaneers, fallout survivors, jet pilots, and queens. Crowded by these ghosts of her nightmarish imagination, Mon´e performed a fantastic set. I have seen the future: it’s a strobe-lit, amplified, dangerous time… but very stylish. 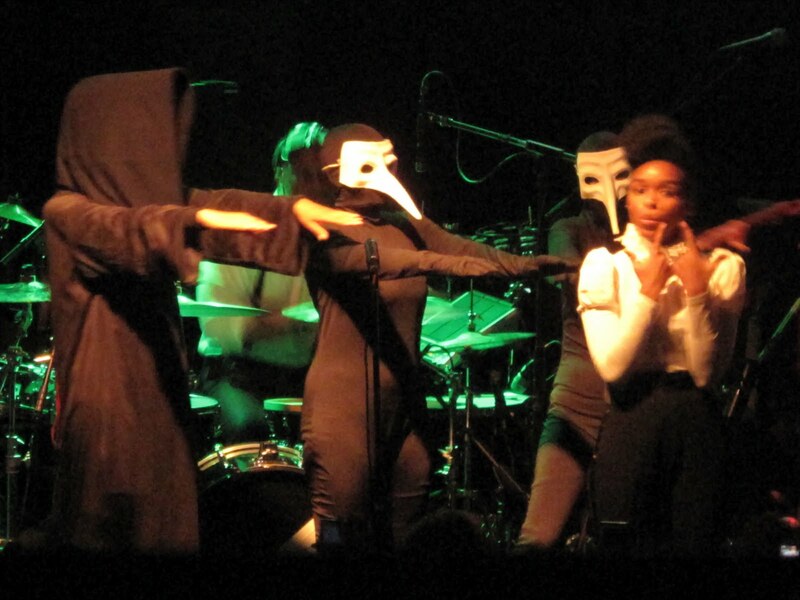 After a steamy Janelle Monae left the stage, the Canopy Club was a hot and fetid tropical locker room. Few bands could have followed her into that sweatbox and pleased me. 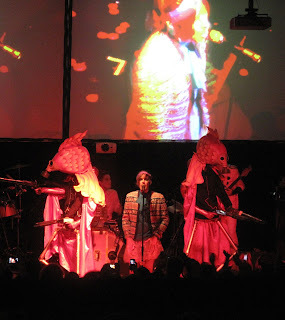 Of Montreal gets credit for using some of the best performance ideas of David Bowie, Peter Gabriel, the Residents, Prince, and Pink Floyd (Alan Parker). While a surplus of eight musicians underlined the beat (or just waved their arms in the air), impressively costumed dancers elbowed their way to the edge of the stage. This unwieldy ensemble made even the generous Canopy stage seem unmanageably cramped, with randomly-attired stage hands (one in white t-shirt, one in shirt and tie) dashing back and forth to maneuver into place various large props. Some of these apparitions that wandered in from stage right were majestic and terrifying, though the best costume designs of any concert I have seen had apparently been given no script other than contorting sexually with two blonde women in gold bikinis. It’s good to see a young band try so hard to do something other than play great songs. I admire the effort to add a dimension of spectacle to alt-disco music. Frontman Kevin Barnes tried to push his magnetism, charisma, and beauty past its limits to lead the crowd into a rave atmosphere of unrestrained sexuality. But in the end this felt less liberating than shallow. I applaud the effort to have a stage show, am impressed by the disturbingly surreal costumes, but found it all undermined by haphazard choreography and question whether the thin foundation of dance music can support the art they try to build on top of it. Midway through the set was a moving performance of two newer songs, including “Casualty of You.” With a stripped-down instrumentation, disturbing animation, and a biting electric violin solo, this moving ten minutes of the show showed me what the band could accomplish if they did more serious writing. And then for an encore they did the song about how the singer can “do it.” I clapped loud for another encore. From Janelle Monae.